Grandparents Day at granddaughter Molly Kate’s kindergarten in Baton Rouge, Louisiana, was a delightful first for grandparents Baboo and Nana. All the grandparents packed our grandchildren’s classroom, proud planets circling our own little suns. 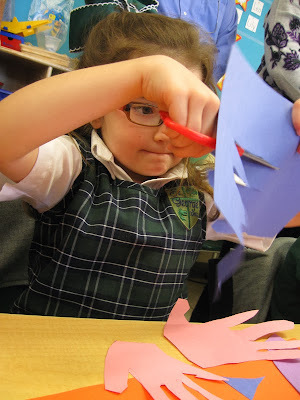 Molly Kate applies scissor skills to the outline of a grandparent’s hand. Each student worked together with one to four adults on a well-planned, simple craft. 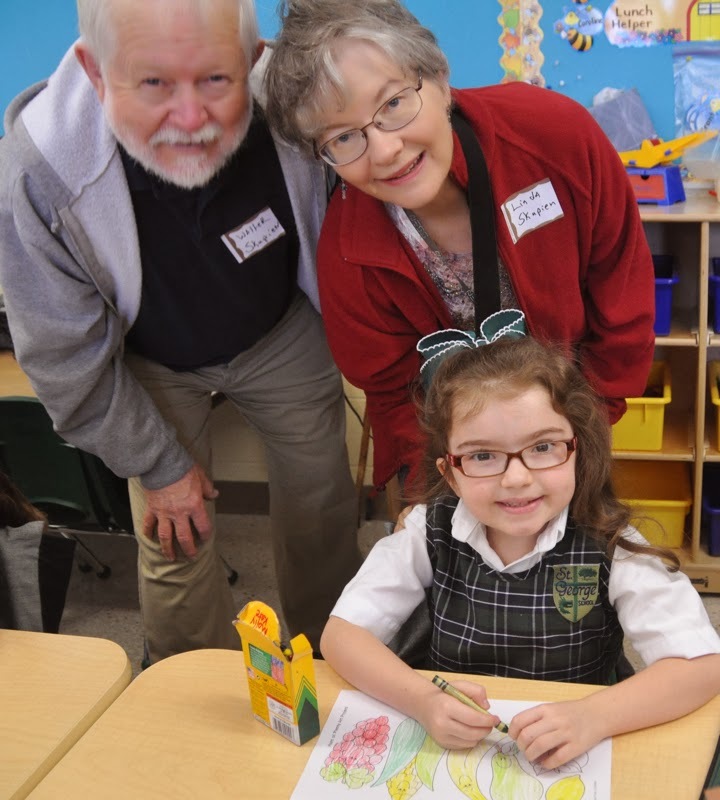 Thanks to other grandparents, I was able to have a turn in one of the extra little classroom chairs so that I could work with Molly Kate. All four of her grandparents traced the outline of one of their hands and wrote a note to our granddaughter on the paper hands before she cut them out. 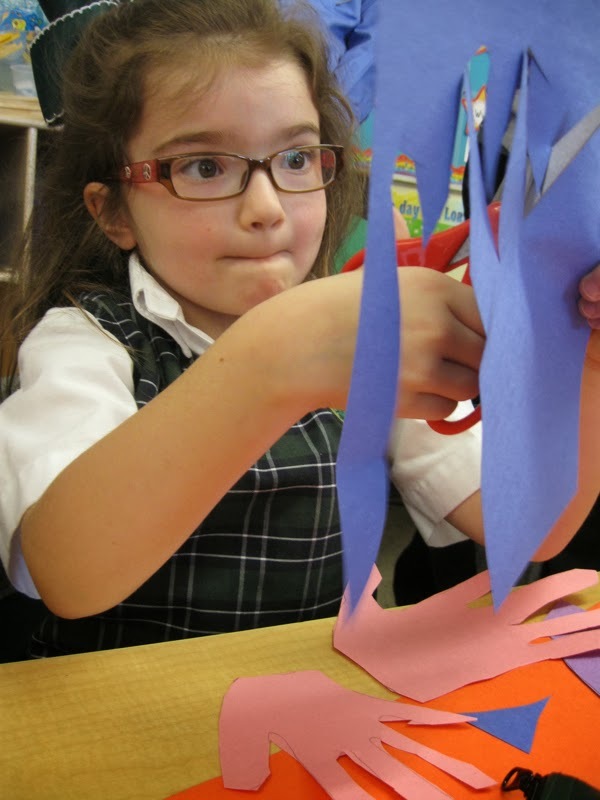 She used the hands and other embellishments to decorate a construction paper placemat. 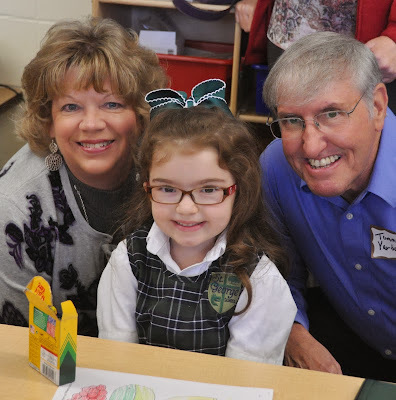 Her teachers later laminated the granddaughter-grandparent creation as Molly Kate’s take-home reminder of Grandparents Day 2013. 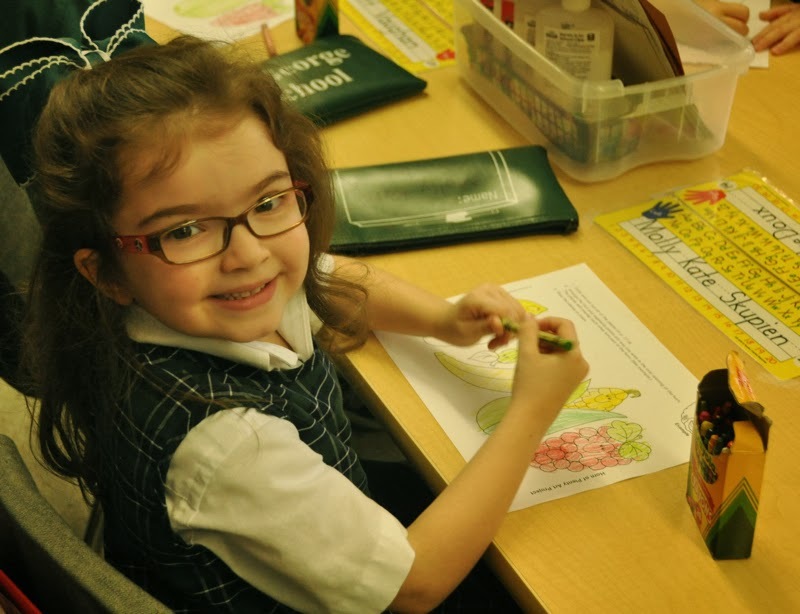 My reminders of the kindergarten’s happy celebration are the above “from-where-I-sit” snapshots and the photos below that an obliging teacher’s assistant snapped. 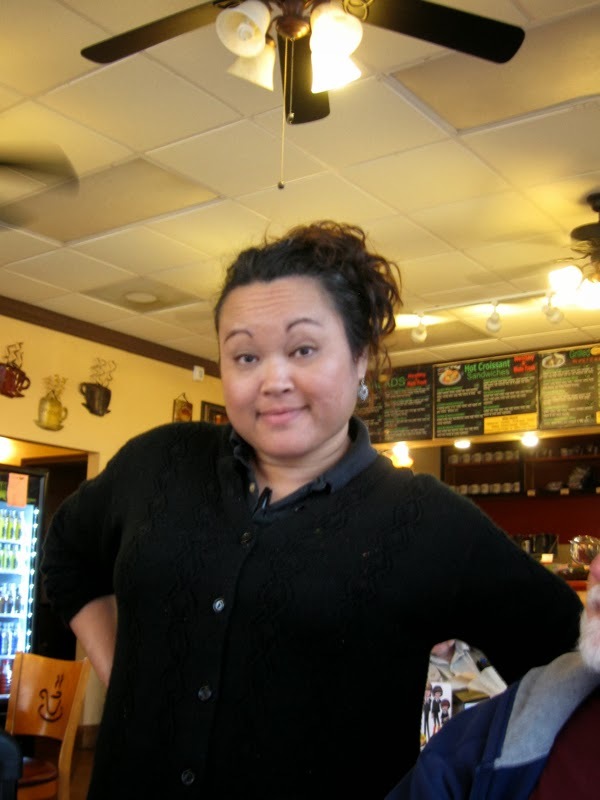 Today at our second home, AKA Coffee Fusion, Anna, a manager there, stopped by our table. Conversation ensued about her attempts to lower blood pressure and blood sugar levels through diet and exercise as an alternative to starting prescription medications. She gave me a new slant on one of the realities I find aggravating as I face the same challenges. “They put sugar in everything. That’s just plain rude!” she said. I understand her frustration. Hats off to Anna and to all of us who are trying to go healthier and who deal with the frustrations that accompany lifestyle changes. Cold weather, a fire in the fireplace, and January 2014 flying by all prompted a recent discussion about travel plans for 2014. The discussion quickly veered toward the Smoky Mountains and good memories. 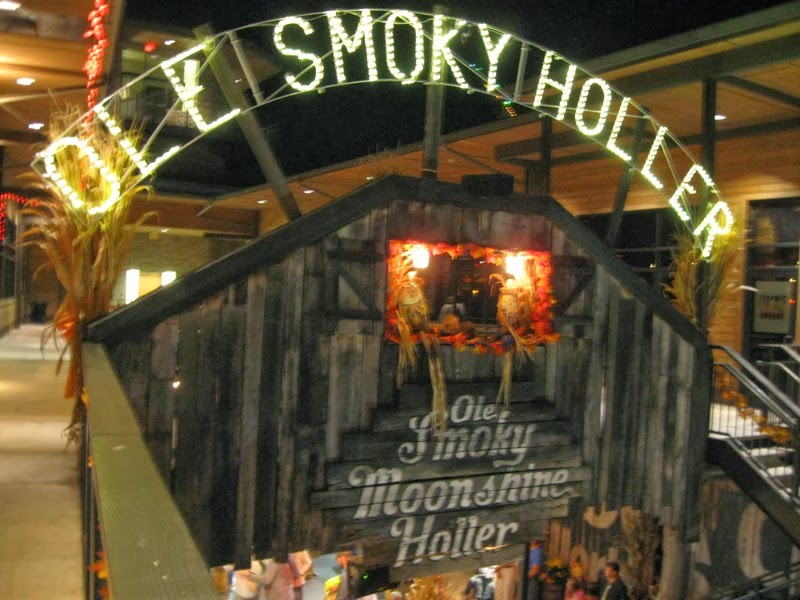 Our most recent trip in fall of 2013 included a visit to the Ole Smoky Moonshine Holler in Gatlinburg, Tenn. Every few years a new fad makes the scene among Gatlinburg tourist attractions. 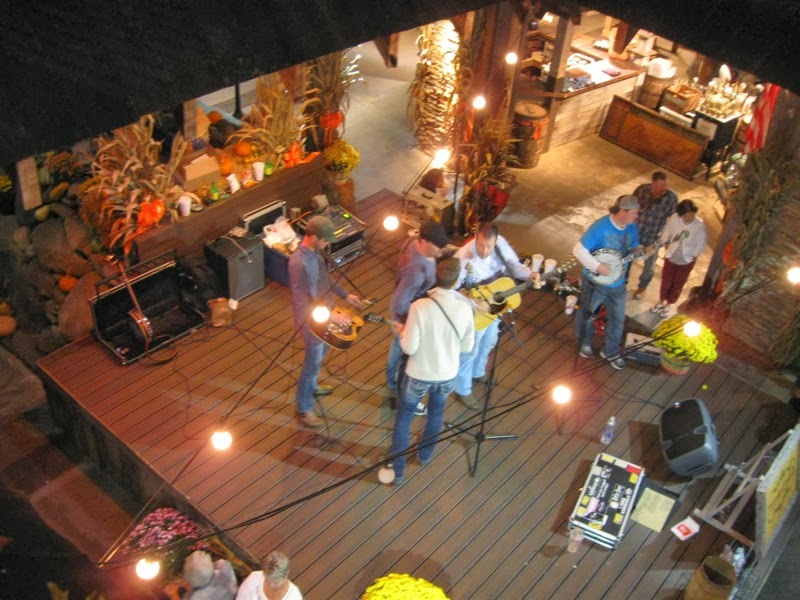 We have seen arcades, various renditions of miniature golf, laser tag and zipline operations come and go. 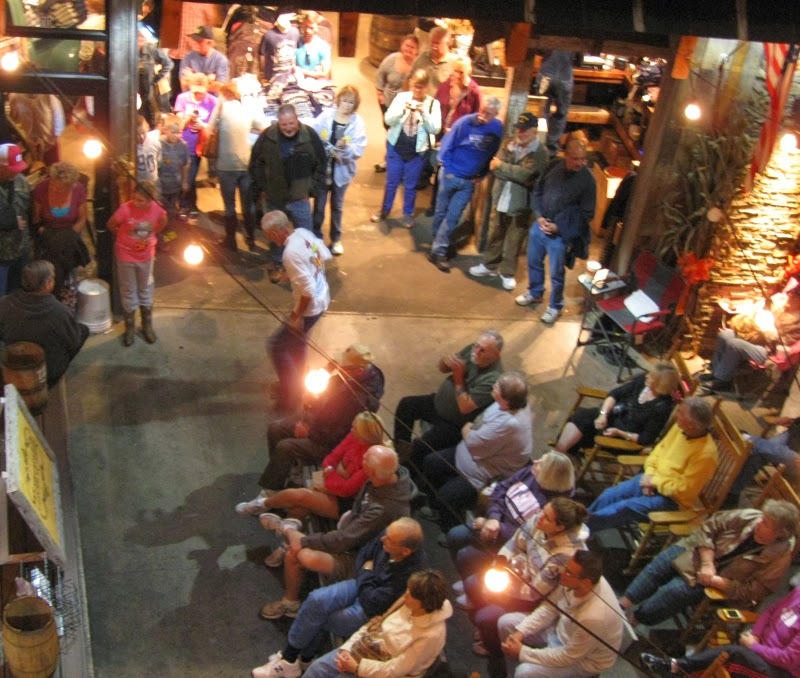 The promise of bluegrass music prompted our visit to the Moonshine Holler. My new life as a stroke survivor often supplies me with extra excitement on our travels, and the moonshine distillery was one of those times. 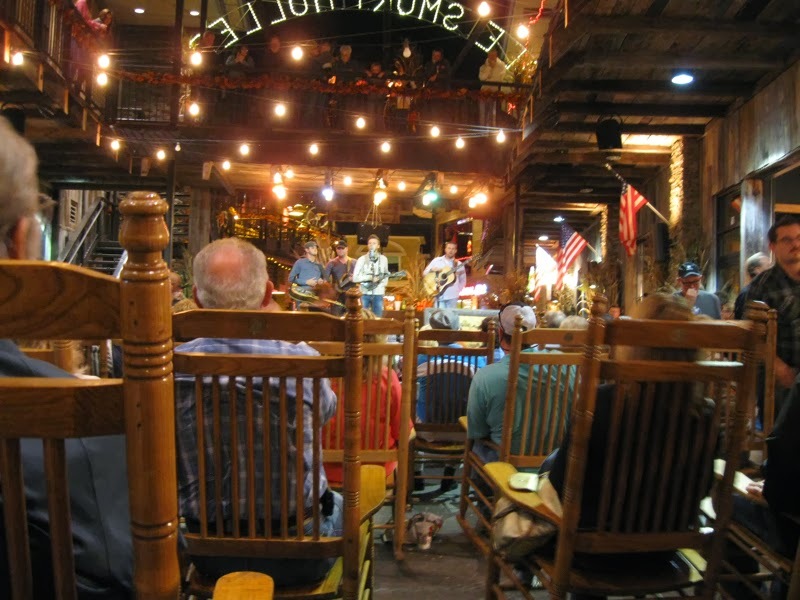 When we walked into the “holler” that evening, extremely happy patrons packed the seating and walkways The constant movement and noise created immediate sensory overload. I don’t always do crowds well. Limited space for my wacky arm and leg movements and the effect of unintentional bumps and scrapes that come in a crowd heightened my anxiety about staying upright. Every bench and rocking chair was filled, but Hubby found an unoccupied hay bale and helped me get seated. 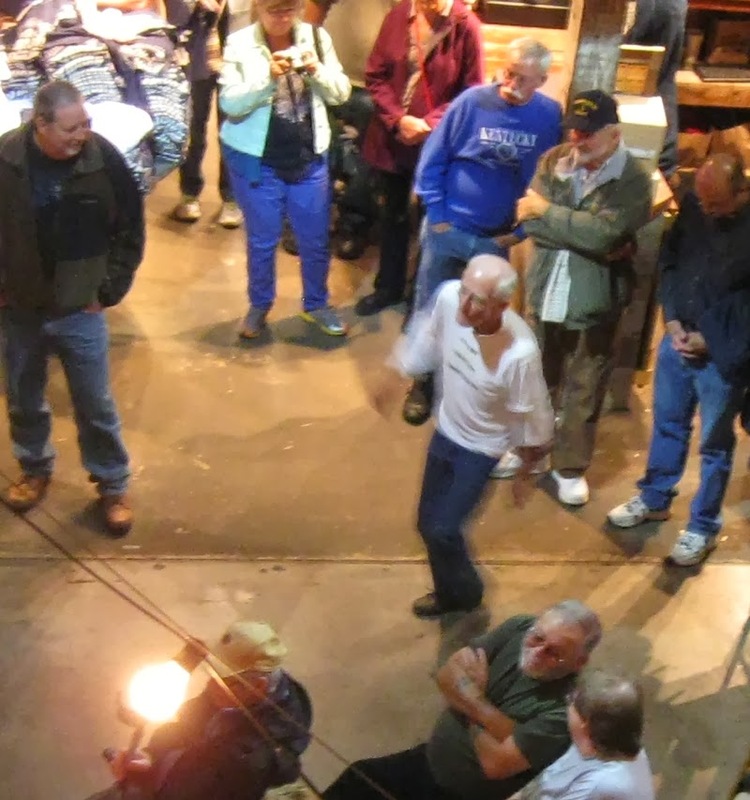 My stress level eased, and off he went to check out the moonshine tasting and to take pictures. But it didn’t take long before a strong alcoholic odor was singeing the inside of my nose. Whoo! Fermenting mash was right behind the half wall that propped up me and my hay bale. But I wasn’t about to brave the crowd to change locations, and there was no empty spot available for me to move to anyway. I wondered if those moonshine fumes would eliminate the final shreds of balance I had left. At least I was seated. That made me close to the floor, a shorter distance to fall if I keeled over. Hubby eventually came to collect me for the bluegrass band’s next set. He found empty rocking chairs and defended them valiantly until I could take a seat. The rest of the evening erased earlier uncomfortable moments. An unexpected treat was a conversation with a young physician’s assistant in practice with a geriatric doctor. She recognized that I was a stroke survivor and wanted to know about my progress. There was also a geriatric clogger who danced practically nonstop and made me ponder whether I could include clogging in my at-home physical rehab agenda. This clogger’s arms and legs were just a blur as he danced to a fast tempo. He was definitely an elder on the move. Grandson Nate was interviewing me via Skype for a school assignment yesterday. As I responded to questions about my childhood, I got a kick out of watching nine-year-old Nate’s unconscious mouth gymnastics as he concentrated on writing down answers to the questions. “Walter, come watch Nate’s mouth,” I whispered to Hubby. On the screen Nate’s mouth immediately quirked into the tiniest of smiles. I was busted. “You heard that, didn’t you,” I asked. “Sort of,” he said. Evidently that microphone in the MacBook Pro picks up much better than I had realized. 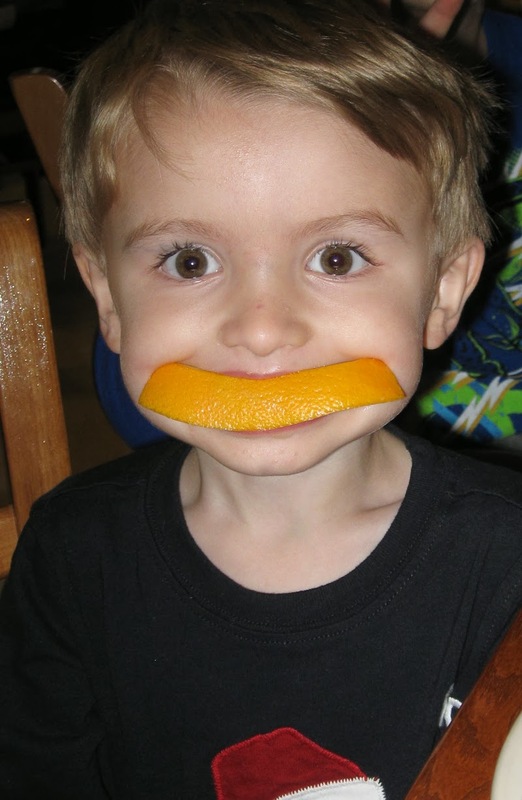 But a quick visit with a grandson via Skype is much better than no visit at all, even if I was caught in the act of gushing over said grandson’s endearing mannerism’s. Youngsters involve their entire bodies when they are concentrating. That really is totally living in the moment. 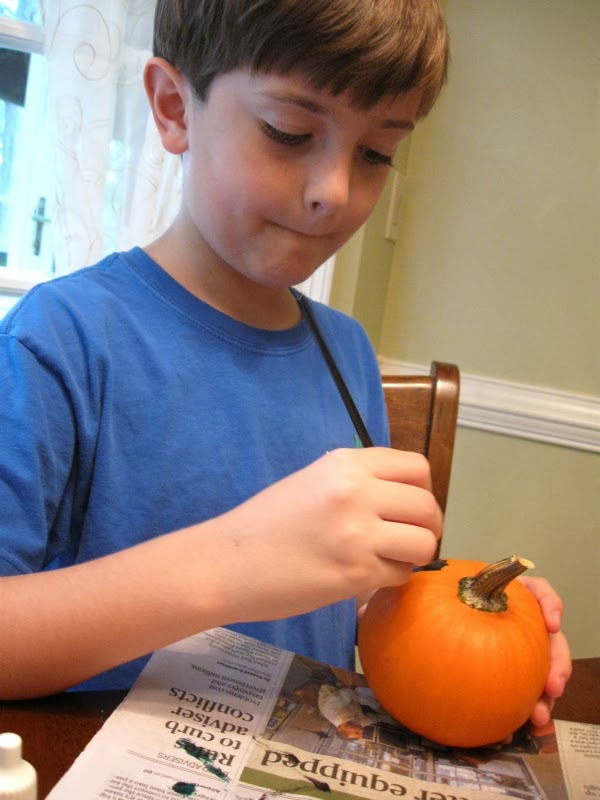 Nate concentrates, totally in an October 2013 moment. 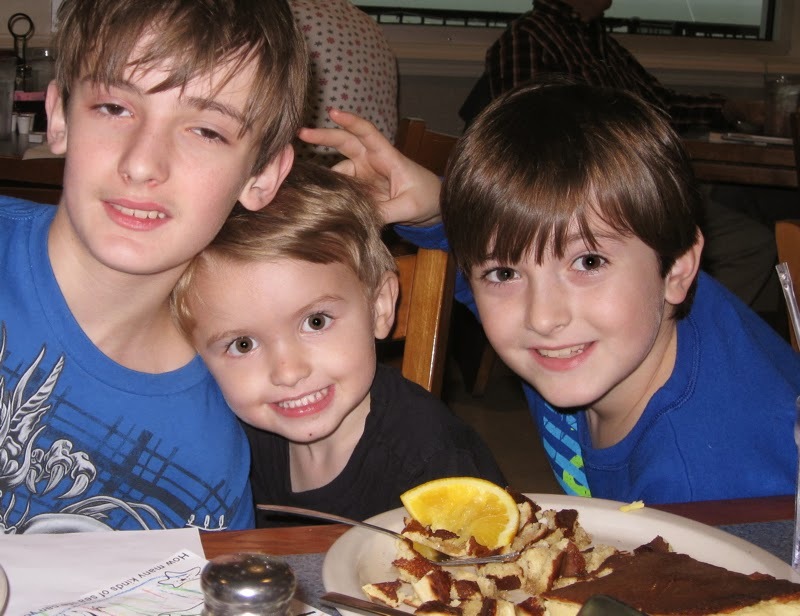 When Walker, our youngest grandchild, arrived at the restaurant where we gathered with our sons and families for a holiday breakfast, he immediately claimed a seat between his older cousins Luke and Nate. 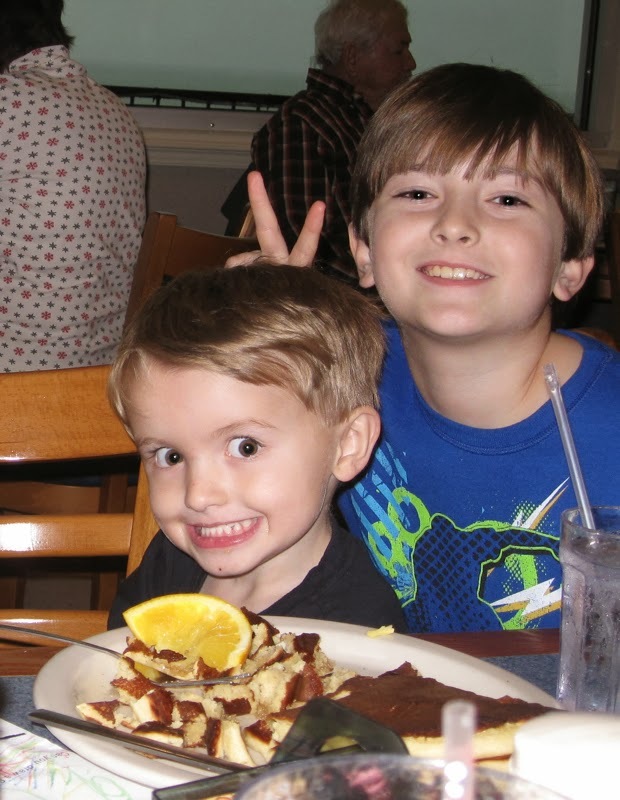 Nate, 9, gives Walker bunny ears. Husband Walter and I have actually been to one of the 10 weird Alabama sites to visit that Kelly Kazek listed in an article I saw recently in the Mobile Press Register. I was amazed that there was another person in the universe interested enough in a giant blue paperclip to actually write about it. Just who is Kelly Kazek? My curiosity was piqued. Please note that I used "piqued" and not "peeked" or "peaked." I have deleted several free Kindle books after the repeated incorrect use of those three words or for other recurring vocabulary or grammatical transgressions. I googled to be sure I spelled “piqued” correctly. Are there some words that you just never are totally confident that you are getting the spelling right? To check I went to Vocabulary.com here, a site I had not encountered before. It was a lot more entertaining than the dictionary sites I regularly check. But when did “homophone” instead of “homonym” come into use for words that are spelled differently but pronounced the same? That’s the trouble with Google. One search just raises more questions. But I digress. These vocabulary observations are mere divagations. I encountered the word in Alexander Nazaryan’s essay here on Hyperobjects: Philosophy and Ecology after the End of the World, a book by Timothy Morton. The essay was linked from “The Browser: writing worth reading.” Nazaryan piqued my interest with a peek at Morton’s work. Why did Nazaryan use “divagations” instead of the simpler and more familiar, at least to me, “digressions” or “ramblings”? Thesaurus.com did include "divagation" as one of the 14 synonyms for digression. But the snippet of information in the first definition at Vocabulary.com enlightened me: "any diversion intended to distract attention from the main issue." Nazaryan was introducing Morton's discussion of ideas so incomprehensible that we may not even be able to think about them. They are far different from mundane concerns that usually garner attention and that divert human beings from grappling with thoughts of monumental realities and possibilities. Nazaryan's prose was precise, not pretentious. Or his word choice could have been sly humor sparked by the breadth of the book’s subject, and I totally failed to get it. I, however, used "divagations," simply as a synonym for "digressions." Uh oh. Redundant! Perhaps I need to cut back a bit on rants about the shortcomings of some ebook authors. At least they are actually producing something! Oh well. Back to Kelly of the paperclip. Kelly Kazek is the North Alabama region reporter and humor columnist for al.com. She is an award-winning journalist and humor writer and the author of eight books, according to the Alabama online news site al.com. Through Google I also found a bio here that she had written and posted during an earlier news position. I chuckled, read more of her columns from that stage in her career, and laughed some more. I am sure my fascination with the big blue paperclip, #9 on Kelly’s list, will cement my status as a seasoned and sophisticated traveler. On our way to various Alabama and Florida destinations along the northern Gulf of Mexico, we sometimes take the old causeway across Mobile Bay instead of Interstate 10. 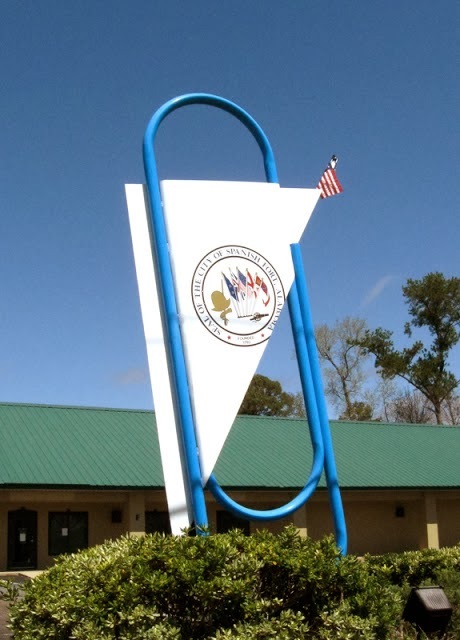 That's when we pass that paperclip in Spanish Fort, Alabama. Husband Walter treated me to a surprise paper clip photo op stop in March of 2010. I eventually posted about it here. May delightful adventures be yours this year. In The Reluctant Prophet by Nancy Rue, Allison is a middle-aged, single woman who lives in picturesque St. Augustine, Florida, and regularly attends a historic and traditional church near her home. When she feels a distinct poke in the ribs during a Sunday service, she is convinced that God has “nudged” her to buy a Harley. Still, the call to buy an expensive motorcycle seems bizarre to her. Her income giving carriage rides to tourists is miniscule and riding a motorcycle is far out of her comfort zone. Then her eccentric carriage horse takes her into a dangerous section of the city and into the lives of individuals who barely manage to stay alive there. The nudges continue. 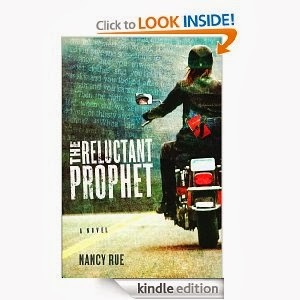 Over the objections of church friends, she winds up at a Harley dealership. A brand new red Heritage Softail Classic calls to her, and she is soon a Harley owner. She also loses her job, falls out of favor with her longtime neighbors and makes new friends. As she faces threats, she discovers new depths of love for others and learns to trust God for safety, direction, life’s necessities and living life victoriously. In the weeks between my finishing the book and this review I have forgotten if this was one of the e-books with the aggravating errors grammatical and otherwise. But if there were those errors, they have faded beside my enjoyment of this quick read spiced with humor, heartbreak, a refreshing heroine and interesting characters. 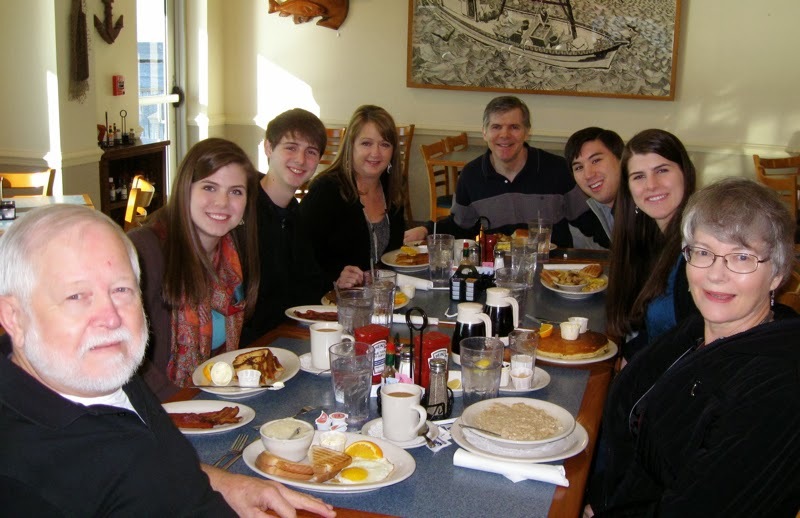 Husband Walter expanded a family tradition to the holidays this year with a Saturday, December 28, breakfast for our clan of 12 at one of our favorite breakfast spots, McElroy’s Seafood Restaurant, an eatery overlooking the Biloxi small craft harbor. Our sons grew up with the tradition of Saturday breakfast at Harbor House, as it was known then. Daughter-in-law Sarah was initiated when she and our oldest son Walt were dating. 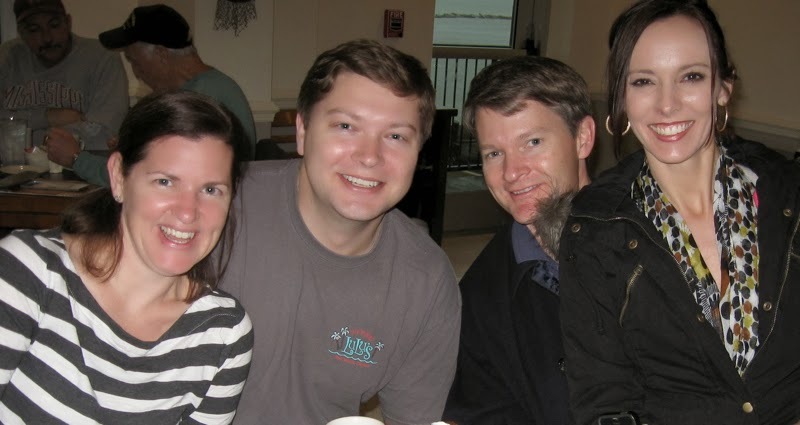 Daughter-in-law Katie, a Baton Rouge, Louisiana, native, already had her own McElroy’s tradition, thanks to frequent excursions with her grandfather to Biloxi and McElroy’s. The restaurant was swept away by Katrina in 2005. It reopened in 2012 with the new building elevated on towering support piers as required by the post-Katrina regulations for construction in hurricane surge zones. 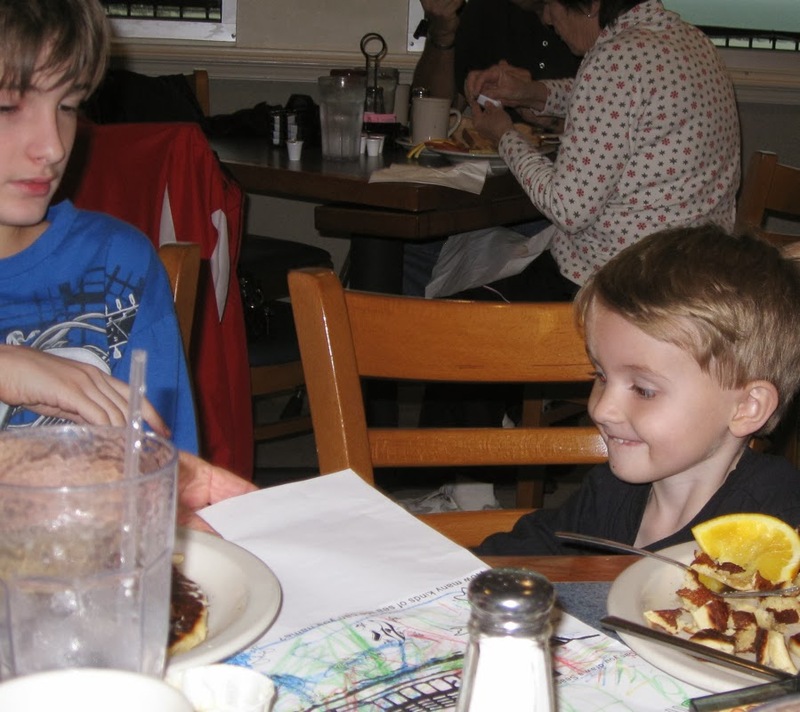 It still has a casual down-home appearance, friendly, attentive wait staff, huge pancakes, biscuits, and the best eggs and grits ever. 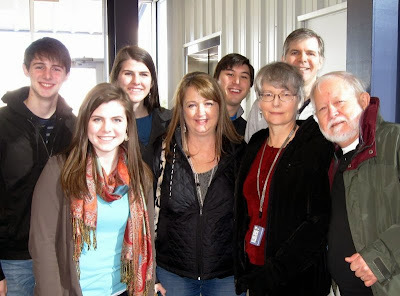 Another special treat was a New Year's visit from my brother Mike and his family from Virginia. 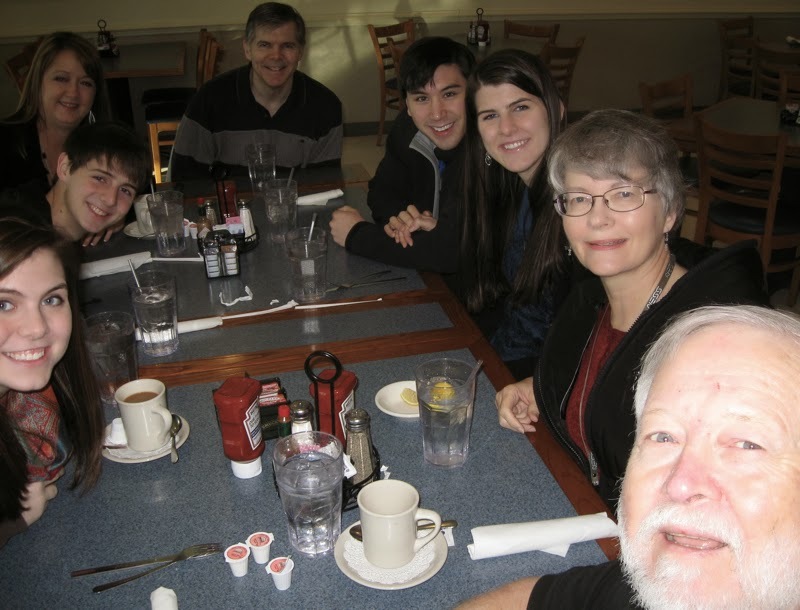 On the morning of their departure for sightseeing and visits to other family members, we had breakfast together at McElroy’s. Hubby's arm just wasn't long enough for this group photo. Husband Walter tried to fulfill my desire for everyone to be in the photo, including him. After a couple snaps, he dealt with the limitations of my little point-and-shoot Canon by enlisting the help of our niece Lauren. We had visited briefly with her and her family earlier. They were having a bon voyage breakfast for Lauren. After taking the photo below, she left to drive to Oklahoma for her next Mississippi National Guard training assignment. Thank you, Lauren, for this photo and for your military service! 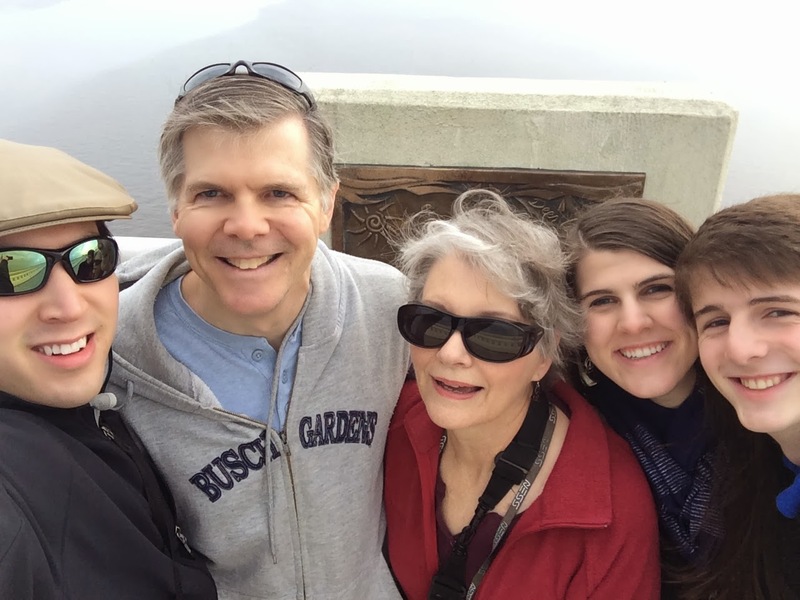 Mike and his family are even more determined to capture memories visually than Hubby and I are. The helpful McElroy’s hostess snapped this group photo with Sonya’s phone then with my camera. 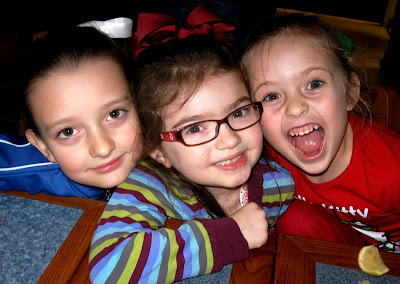 She and Lauren definitely went the extra mile to help us preserve memories of a happy time. From left, back, are nephew Matthew, niece Becky, her fiancé Josh and my brother Mike; front row, niece Amanda, sister-in-law Sonya, me and Husband Walter.